Peter Snowden said he could not pass up an opportunity to tackle the Group 1 Moir Stakes (1000m) with the in-form Redzel, despite the top-quality field that will assemble at Moonee Valley. With a combined 12 Group 1 wins between Chautauqua and Buffering, the pair that will in all likelihood bookend the field in running are all the talk of the Moir. 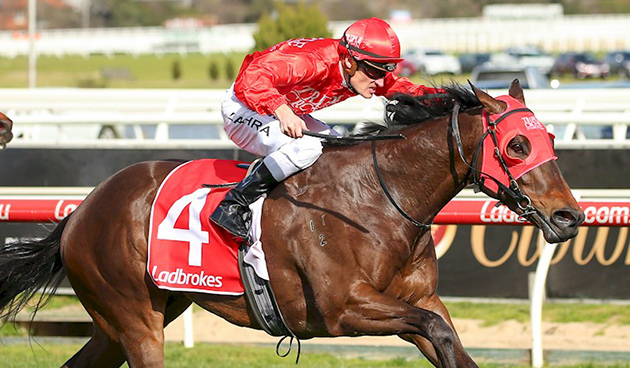 Redzel comes in with the next best thing than a G1 itself – the scalp of a G1 winner in Under The Louvre last-start in the G3 The Resimax Stakes (1100m) at Caulfield. And Snowden said it was that victory that caused him to have a go with the Snitzel gelding in the Moir. “He’s going really well,” Snowden told Racing.com, after Redzel had a gallop at the Valley on Monday morning. “You’d probably say he’s outclassed, but if you look at the times he’s running and the way he’s winning, he’s definitely worth a crack at it. Also coming to the Valley on Moir night from the Snowden Racing camp is Detective, who the ex-Darley trainer said was no sure thing to progress to the Caulfield Guineas beyond Friday’s Stutt Stakes. Snowden said he bypassed the Guineas Prelude thinking Astern would be there before the Godolphin colt was ruled out of a Melbourne trip – but he felt the diversion was a blessing in disguise. “Astern pushed me that way, but I’m glad I did,” the trainer added. “The way he’s racing now, I just think this might be an option for him, and if he happened to win it [the Stutt], we’ll see what happens [for the Guineas]. “The form stacked up on Saturday, so he’s going to come here with form behind him, and in good condition and a race that I reckon will suit him. “I never thought he was up to that [Guineas] grade, to be honest, but he’s proved me wrong twice this preparation. Snowden’s got everything crossed that Randwick comes up a Good surface on Saturday, withCapitalist set to run in the Group 2 Roman Consul Stakes (1200m). As it stands, there’s an 80 per cent chance of rain on Thursday and a possible storm, and potentially more showers Friday, although Saturday is predicted to come up a fine and sunny 23 degrees in the Harbour City. Snowden said he’d consider bypassing the race if Capitalist got another wet track, after failing first-up in the San Domenico Stakes on a Soft 7. “I’m desperately hoping for a Good track come Saturday, and if it wasn’t, I wouldn’t run him,” he said.